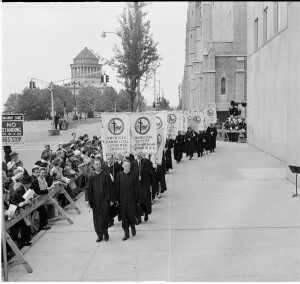 September 14, 1954 General Board of the National Council of Churches votes to establish headquarters in New York City. 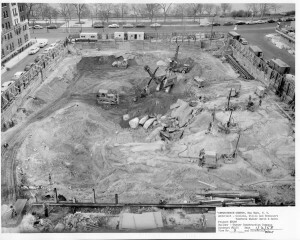 November 17, 1957 Groundbreaking ceremonies are held. 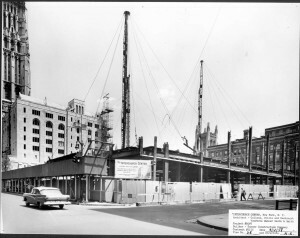 After a worship service in James Memorial Chapel at Union Theological Seminary, the congregation moved in procession to the future site of the Center, where under an architectural rendering of the building, the first soil was turned. 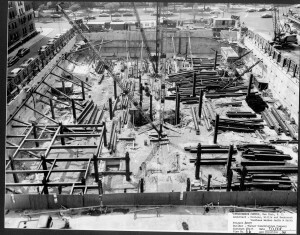 Excavation of the site began shortly after the ground breaking ceremonies. 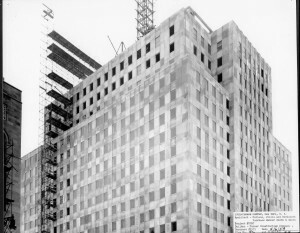 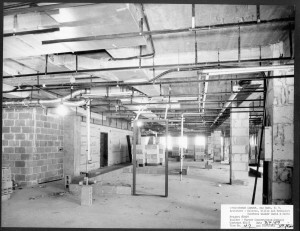 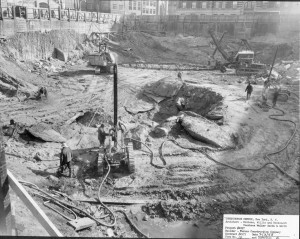 Construction of the site 1957-1960. 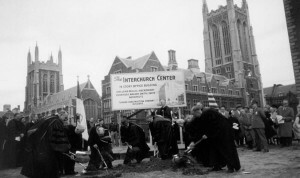 October 12, 1958 President Dwight D. Eisenhower laid the cornerstone for The Interchurch Center. 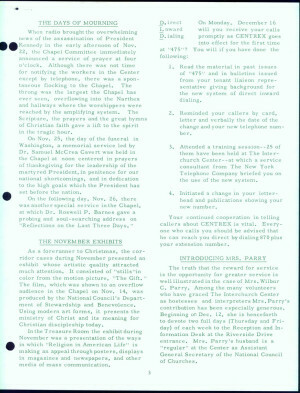 National leaders of denominational and inter-denominational agencies, representatives of the Morningside Heights community and of the New York churches took part in the ceremony, In his address, President Eisenhower described the cornerstone as symbolizing a “prime support of our faith, the Truth that sets men free.” A sealed cooper box within the cornerstone contains important historical documents. 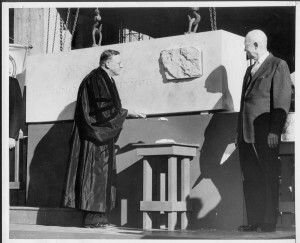 The Interchurch Center cornerstone was laid by The President of the United States in 1958. 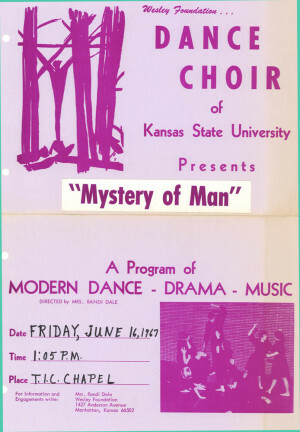 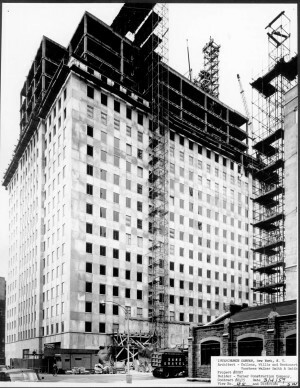 May 29, 1960 Dedication ceremonies were held to mark the official opening of the building. 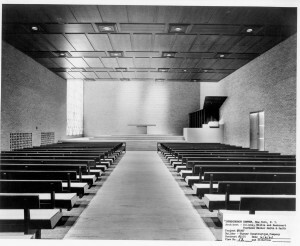 Known as ‘Dedication Sunday’, the day began with worship and thanksgiving in Riverside Church. 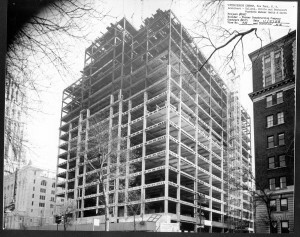 The assembly then processed over to The Interchurch Center’s main entrance, fronting Riverside Drive. 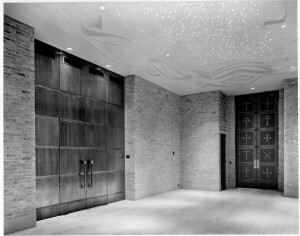 There, in solemn ceremony, the keys to the building were formally bestowed upon the Center’s director, Rev. 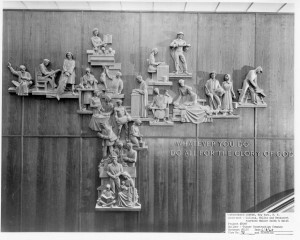 Samuel McCrea Cavert, and other officials by representatives of the architects and builder. 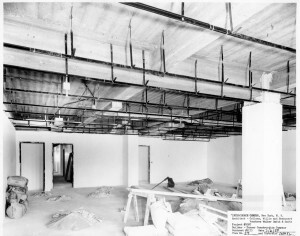 A forty-foot ribbon across the entrance was cut by Mr. Edmund F. Wagner, President of the Board of Trustees, and the Center was formally declared open to tenants and visitors. 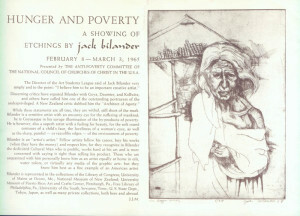 A scroll of appreciation was presented to John D. Rockefeller III in honor of his Father’s John D. Rockefeller Jr.’s contribution to The Interchurch Center.